Anyone wanting to understand the Arab Spring must look to Egypt in 2011 and ask: How did a popular uprising end with swapping one autocrat for another? New York Timescorrespondent David D. Kirkpatrick begins Into the Hands of the Soldiers with the final days of the corrupt and abusive regime of President Hosni Mubarak—seemingly permanent, but heading for collapse. Mixing accounts of major political episodes and popular mobilizations, he walks readers through each successive turn of the revolution. There was the astonishing time in Tahrir Square, where hurling teargas canisters back at the authorities became a vocation for a generation. Then came the jubilant fall of Mubarak, followed by an uneasy and unclear transfer of power. A year later, the election of Mohamed Morsi as the new president of Egypt took place against a backdrop of continued unrest. Finally, the troubling moment in question arrived: the military coup that would later put President Abdel Fattah el-Sisi in power. A virtue of Kirkpatrick’s book is making none of this seem inevitable. The events of 2011 were “a real opening” for the country, he argues, and their unfortunate conclusion was not a necessary one. His depiction of the revolution may sometimes lack the familiarity and flair Egyptian writers have brought to bear on these events, but Into the Hands of the Soldiers stands apart by complementing its on-the-ground account with a close look at how the White House handled the ongoing tumult. How did Egypt's popular uprising end with swapping one autocrat for another? The United States’s role in Egypt—a country second only to Israel as a recipient of American military aid—was deeply conflicted. Then-president Barack Obama’s enthusiasm for the democratic movement and his outreach to a floundering Morsi were sincere, but his administration was hobbled by internal divisions. Kirkpatrick deems the response uncoordinated and lackluster, beset by an “American schizophrenia” that only complicated an already fraught transition. If the Arab Spring is often treated as a question of the distribution of power, Kirkpatrick helps bring into focus the question of plurality. He has special interest in the prominence of women in the revolution as well as the misogynistic challenges they faced, including waves of sexual assault. He also keenly follows the role of minority groups like Coptic Christians (against whom there is a long history of violence in Egypt), from the hopeful participation of young people in early protests to an eventual embrace of Sisi. 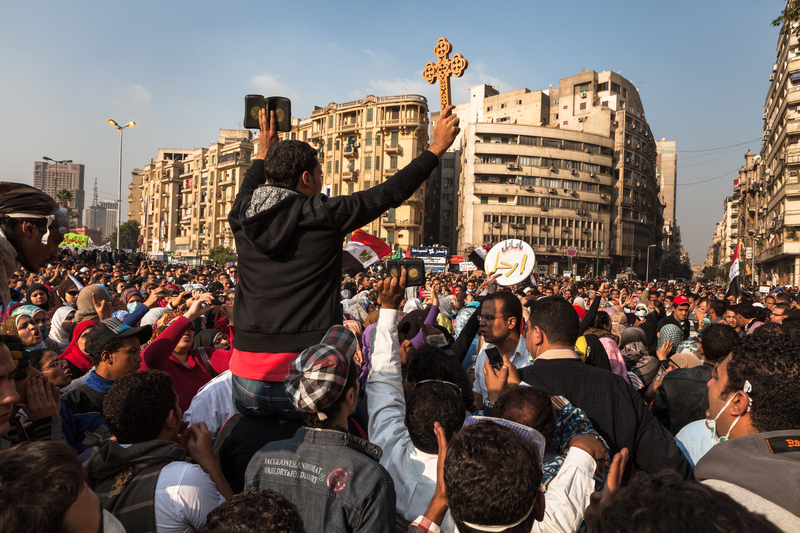 He contrasts the “pluralistic little republic” of Tahrir Square, where Muslims and Christians guarded each other during prayers, with outbursts of religiously motivated attacks across the country. In his view, the Arab Spring neither unleashed nor put an end to sectarian violence but constituted a series of poles around which existing tensions sometimes flared, sometimes lessened. Into the Hands of the Soldiers also reads as a useful primer on Islamism. Kirkpatrick’s nuanced, historical overview touches on a variety of topics, from the reforms of the late-19th-century scholar Mohamed Abduh to the grassroots power of the Muslim Brotherhood, from the recent spread of conservative, literalist Salafism to how militant groups like ISIS were emboldened by Sisi’s seizure of power. Kirkpatrick closely examines the Muslim Brotherhood, an organization whose fortunes sharply rose and fell with the revolution. He is more charitable than many critics, emphasizing the Brotherhood’s moderate streak and commitment to nonviolence. But he is not shy about his reservations, including the concern that their political ambitions would result in a system in which Muslims were inevitably “more equal” than their fellow citizens. Despite the bloodshed and betrayals it chronicles, Into the Hands of the Soldiers should be seen as an antidote to the cynicism that set in after the Arab Spring. As far as Morsi goes, Kirkpatrick describes him as others have: inept and ineffectual, “a second-rate amateur of a president.” Whatever one’s views of Morsi’s flawed rule, however, Kirkpatrick reminds us that this was the first democratically elected government in modern Egyptian history. And the Muslim Brotherhood would pay dearly at the hands of the military, who ousted them from power barely a year later. On this point Kirkpatrick has harsh words for the liberal Egyptians he was initially so taken with. Their frustrations with Morsi and long-held suspicions regarding the Muslim Brotherhood, warranted though they may have been, led them to another round of mass protests. A cunning Sisi took this as his mandate and the generals swept into power days later—a military coup framed as a defense of Egypt’s democratic revolution. Despite the bloodshed and betrayals it chronicles, Kirkpatrick’s book should be seen as an antidote to the cynicism that set in after the Arab Spring. Against those who suggest that “the people of the region would have been better off if they had never risen up,” Kirkpatrick defends the aspirations of the Egyptian uprising while rightly mourning its outcome. The defeat of the revolution did not make it any less worth making. This article also appeared in print, under the headline "Egypt's revolution, undone," in the August 20, 2018 issue. Ryan Richardson is the former manager of office operations at America Media.